A funny story/tidbit about me and Kevin....When we first started dating, I went out of my way and tried really hard to get him the ultimate Christmas gift. Even though we had only just started our relationship, I knew he was the one. So I knew the first gift I gave him I wanted to set the expectations and express to him how strongly I felt. I went out and shopped around a ton, then spent quite a bit of money on a really nice watch for him. After all my efforts, Kevin informed me as he opened the gift, he didn't wear watches and would not have a use for this gift. Sorely disappointed I can tell you that still after seven years of marriage, I haven't bought a watch for a single person, including myself. Surprisingly, when I was recently asked by JORD to review one of their wooden watches I was finally open to it and adding this accessory into my style again. Being that this was such a unique gift and more than that an eco-friendly one, I thought it was about time I give one a try. "It's about time someone delivered an unconventional answer to age-old wrist candy. JORD watches are designed to take people back to nature and away from today's metal & rubber. We want to challenge the norm by making unique time pieces as a focal point for everyday fashion." 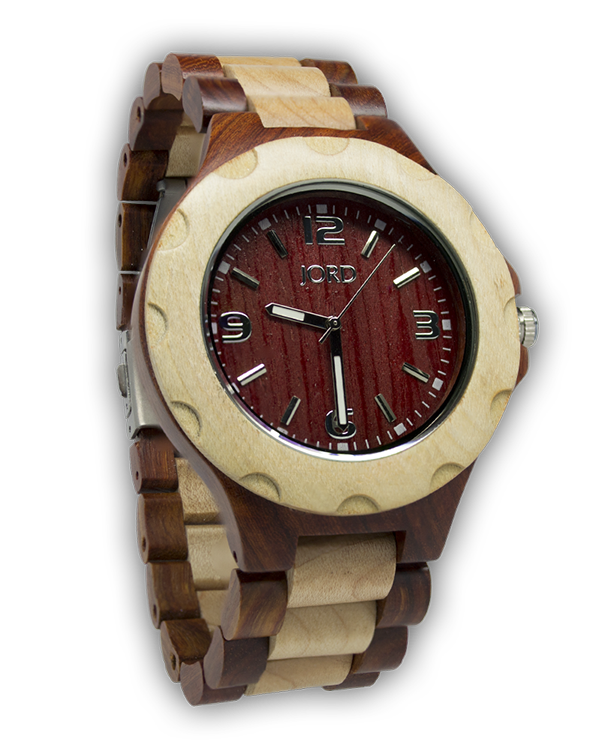 JORD provides "wood watches are one of a kind, premium quality time pieces, hand-crafted with sustainable materials from all over the world". JORD sent me over their Sully Series Cherry and Maple Watch. 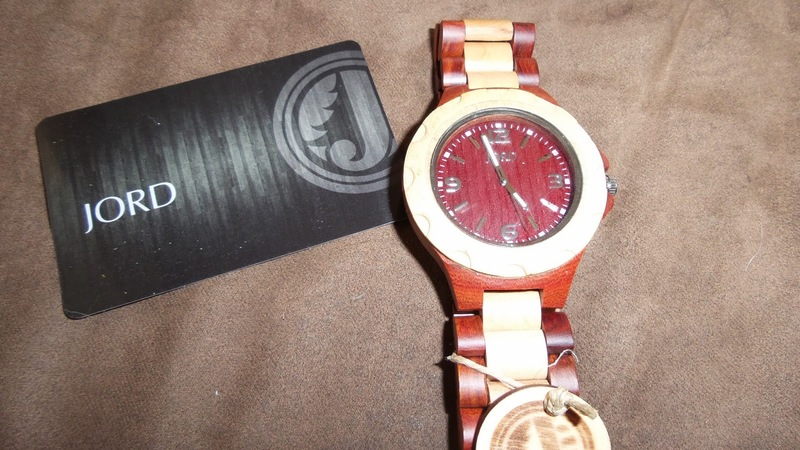 I love the contrasting colors as they truly show the different features in this watch and as they state in their description, it makes it obviously even from a distance that this is a wood watch. The glass face is 33 mm in diameter is scratch-proof and on the other end you can find a single action locking clasp made from stainless steel. Alana actually decided to scoop this review up the minute it arrived through the door and even though its a bit big for her she loves it. All we had to do was remove a few links to get it to fit better around her tiny wrist. We absolutely loved the quality and unique design of this accessory. Recommendation: I think these are great and really awesome quality too! I love the fact that because they are made of a natural wood, no two watches will technically be the same. I don't really see myself paying this much for a watch at this point but in all honesty it's priced really well compared to both other watches of this style AND utilizing a natural, sustainable material. Giveaway: JORD is going to give one of A Lucky Ladybug's lucky readers a Sully Series Cherry and Maple Watch to have of their own! This begins tonight at 8pm 3/10/14. They really are unique! That's why I'd want one! Hmm, I might just keep it for myself, lol! I favor Cherry Wood. I have mostly Cherry wood furniture all through my home. But I do like to mix different shades of wood together. This is such an interesting watch. I'm not sure if I'd want to keep it for myself or give it to my boyfriend. I'll have to try it on first. :) Thanks for the giveaway! I really like the Sully style and would love to have one for myself. I would like to give one of these to my husband for an anniversary gift. He collects watches, but he doesn't have one of these yet. I love all of their watches and I would give this to my husband if I win. Thank you for this chance. I really like the Ely series in Maple. That would be the one I'd choose if I could. 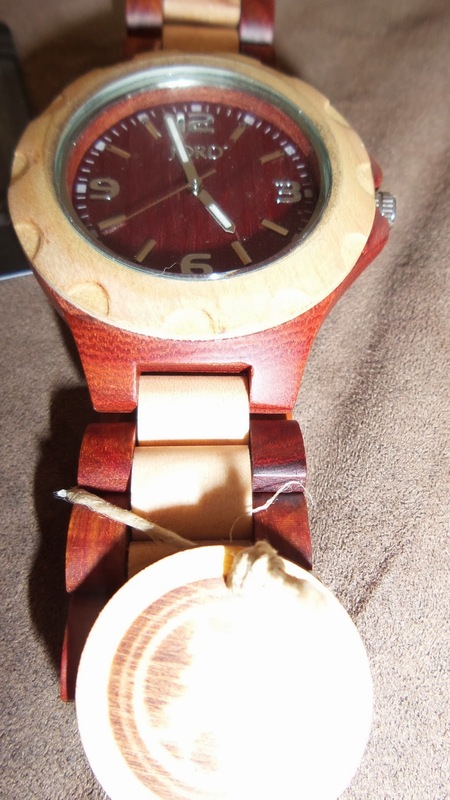 The cherry/maple watch is gorgeous. My husband collects watches and would love to add this watch to his collection. I would love to win this watch for my husband...he doesnt have much that was passed down from his dad to him (he lost a lot of stuff in floods and all) so it would be nice to have something like this watch to be able to hand down to our son. I love wood and the entwined Cherry and Maple look just beautiful together. I think the Mr. would claim this one though. He is a carpenter by trade so I'd have to give in and let him have it if I was lucky enough to win it. Thanks for sharing such a beautiful watch. I'm so excited/hopeful to win this watch because it is freakin' gorgeous! It's rare for something to be both unique AND understated, and this watch is both. As you can tell from how much I love it, this watch would be for ME, haha. i love these watches, the black and maple style 746 is my favorite. These watches are sooooo beautiful! I love the Delamr in red and would give my left arm to own one - just too cool! I like the DELMAR SERIES with White face. My husband collects watches and this would be for him. I love this watch. If i don't win I may have to buy one for fathers day. Great gift idea. I would love to win one of these gorgeous watches so I could surprise my new son-in-law. He has been wanting one from the first moment he saw them! This would be such a nice watch to give to my husband for upcoming Father's Day. I really like that Cherry Wood Watch the most. If I were lucky enough to win this watch, I would be giving it as a gift to my Dad for his Birthday, which happens to be April 28th. Dad would be excited beyond belief to get such a gift from me! My Parents have done so very much for me, it feels so good to be able to something sweet for them. I just love the look of these watches. They are so unique and beautiful. My favorite are the Ely and the Sully Series and I just love them in Cherry! I would really like to give this to my husband!